Here is a list of the best RESP articles on this site. You can find out all the information you need about RESP accounts, contributions, and withdrawals. General RESP rules – One page summary of RESP accounts and their rules. RESP Contributions – Contribution rules and RESP grants with a couple of detailed examples. RESP Additional Grants – Takes a look at the extra grants available including additional CESG, Canada Learning Bond, Alberta ACES program. RESP contribution rules for 15, 16 and 17 year olds. Quebec provincial RESP grants – QESI – This is applicable to residents of Quebec. RESP Withdrawals – Different types of withdrawals from RESP accounts and their rules and tax implications. 8 Things you need to know about withdrawing money from your RESP account. Lays out the details of how to actually withdraw the money. 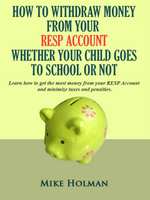 How to withdraw excess money from your RESP account – If your child quits school early, then read this post. How to avoid RESP withdrawal penalties if your child doesn’t go to school. How to Start an RESP account – This article explains how to get an RESP account set up. How to set up the Safest, Simplest and Easiest RESP account. Differences between Self-Directed RESP plans and Group/Pooled/Scholarship Plans. RESP Individual and Family plans – A discussion of the rules, differences and similarities of these plans. RESP vs. Non-registered account – which is better? – A comparison of an RESP account and a non-registered (taxable) account to find out which is better financially if the child goes to school and if they don’t go to school. Trusts are also mentioned. RESP Asset allocation – This post covers some suggested asset allocations for your resp account. Canadian Residency Rules For RESPs – Find out the rules if you might be leaving the country. Keeping It All In Perspective – A reminder that RESP contributions shouldn’t take priority over more important financial obligations. We have 4 grandchildren – ages 10,7 and twins that are 3. We would like to start an RESP for each of them. Would it be better to get a family plan since I have no idea if all will go to higher learning? Can we start with just $500 each for them? How much would the govt portion be? Should they be in our name or the parents’ name? We would not want the RESP to go into our estate upon our death. Hope you can set me straight. Thanks. It doesn’t matter if you have a family account or 4 individual accounts. You can transfer funds between the siblings quite easily in either case. In general, having one account is simpler, and if there are annual account fees, it will be cheaper. If you put the account in your name, then change your will to reflect the RESP account. Alternatively, you can get the parents to set up an account but you will have no control over the account. They can cash it in anytime. Is the book available in stores? I have 5 grandchildren in 2 families, 2 have RESPs with the Canadian Scholarship Trust Foundation with year end closing balances of $24,080 and $13,352. I contribute $2000 to each annually. I need to make a move for the 4 and 3 year olds; the baby can perhaps wait a bit. Should I switch to a family plan? Will I lose any principal doing so? Am I better off taking the whole package to the Bank (RBCDom has my investment accounts) who don’t charge fees? They claim they could make a higher rate of return than the conservative CSTF. Also, the CSTF gives the subscriber (or estate) his principal back when the child is ready for college, which could then be allocated amongst the other children and their plans as needed. I would be willing to put another $3-4000 (tight) into RESPs. I am 73 though and want to also make sure that my estate honours these commitments. The CST RESPs are locked in – there are major penalties for moving them to another company. You are likely better off just leaving them as they are. For the younger kids – don’t use CST for their RESPs. The bank is a fine choice. If you want your estate to honour your wishes, you have to put it in your will. PLEASE HELP: my mother opened an resp for my daughter when she was 2 years old she put it in my name untill she was of age it was a goverment sponsered resp in wich they match the amount dollar for dollar. Problem -my mother was killed when hit by a car in 1992. I do not have the resp papers she always kept them i do not even know who the bank was it was with. my aunt cleaned her apartment and claims she did not find the papers? I have no idea where to look for this resp my daughter is now 24 has done a year and a half of collage with osap and cannot contiune without paying bk a certain amount of her osap? i have no idea how to find her resp what do we do? She would really like to put her resp on her osap to get it payed . Please where do i look to find it i have tryed everything? I have a 18 year old who has chosen not to return to school to continue his education. he is now onhis own and receiving a good wage. So against our wishes he has elected to collapse his RESP. @Dawnelle – It’s not up to the child to collapse the RESP – it’s up to the subscriber (owner of the account). If you have concerns about the timing, you should contact your financial company. You can call the HRSDC RESP phone line 1888 276 3624 and ask them. They know all the contributions, grants and which financial institutions they occurred at. That should tell you which company the RESP was set up at. They also have a record of withdrawals. It’s possible the RESP account was terminated as part of your Mother’s estate. If you are not the subscriber of the account, you might have to get your daughter to phone. Should i open a RESP account in a bank or with a group RESP provider such as Heritage? @Aman – I prefer the bank RESP. Are capital losses on the sale of a security within an RESP netted against the accumulated income earned in the plan or are they netted against your capital contributions. A representative of TD Waterhouse told me recently when I posed the question that it would be netted against my capital contributions. For some reason I am having a problem with accepting that answer. I thank you in advance for taking the time to answer this question. I have twin 6 yr olds and wanted to open an RESP for them for 2011 today with the maximum $5K to get the full 20% grant. The bank informed me that it is too late for 2011 since it is a weekend and the contribution will not be processed until the next business day (which is 2012). Is there any way for me to contribute the 2011 amount in 2012 and get the full grant ($1k)? Or do I basically lose out on 2011? What are my options, if any? @Nazir – It doesn’t matter. Just make the contribution for 2012. Then you can put another $5,000 in 2012 if you want to get another $1k grant. You can carry over unused years. Thanks Mike. It was explained by a bank rep. that I could carry over one year of unused contribution room. This means I can contribute up to $10K in 2012 for both kids, however, I could only get the 20% grant for 2012 and not 2011. From your comment, I can actually get the $2K grant for contributing $10K in 2012? Just want to confirm. Yes, you can get $2k of grants in 2012. I am trying to find out the annualized rate of return on all RESP fund by both group providers (ie. Heritage) and banks. Quite simply put, I want to know if the 6% Heritage claims I made on my son’s fund over the last 3 years is 1. accurate and 2. how it stacks up against the others. I’d be looking for 10 year rates as well. I find it incredulous that this stuff isn’t posted some where the same way mortgage rates are by financial institutions. Hindsight being 20/20, I probably would not have chosen Heritage in 2002 but at least it got us saving for his many years of university – he wants to be a paleotologist! @Lisa Mortgage rates are forward looking. You won’t find historical rates on the bank sites. As for rate of returns – this is a surprisingly complicated topic. The best I can suggest is to phone up some other resp companies and ask them what the returns are. Bank resps are not a single product like your group resp. To compare with the bank you would have to know what you would have invested in for the three/ten years and determine the return for that investment. My advice is not to bother. Even if their returns aren’t any good, there isn’t anything you can do about it now. I have 3 resp accounts for my three grandaughters. What happens to the accounts if I die before they are old enough to withdraw the money? I thought that the parent who also signed the application forms when I set up the accounts with td would take over, but now I’m unsure. Is there a way to set up a benificiary on the accounts like you can do with an rrsp? Thank you for all the great information on your website. @Sue. No, the parent will not take over the account. If there is another subscriber (ie a spouse) on the account, they will take it over. Otherwise it has to be mentioned in the will – ie you have to indicate who should take over the account. Otherwise, the account will go to the estate. It is possible to keep the account intact and transfer to a parent, but it will be up to the executor etc. I have a step-child who is off to post-secondary in the fall, and there is an RESP that the biological parent set up (they are the subscriber). The biological parent doesn’t want the child to go to school, and is refusing to let the child use the RESP. Can we legally force the biological parent to give the funds in the RESP to the child? Is there any recourse? @Jim – The subscriber (owner) of the account controls the money and they are under no obligation to give any of it to the student. I would check with a lawyer however, since a divorce scenario could take priority, especially if the RESP was mentioned in their separation agreement. How do I make sure that I get the goverment matching on my RESP contributions. Is it my responsibility or the Banks. I don’t see where that has happened. Hi Patricia – I’m sorry that your son passed away. It’s very unlikely you can do anything. If your son opened the account it would have been in his name and possibly joint with his wife. With his death the account should go to the estate or the joint owner if there is one. If the daughter-in-law is the executor, she will likely name herself or another person to control the account. Hello. My husband and I set up a RESP for my nephew. he was accepted by a University. We recently had the grant and interest earned released to him. It is a small sum of $650. The investment monies are in my bank account. I was just informed by the mother that my nephew will not be attending school as he wants to deferr for a year. What do I do now? Will I be taxed or will he be taxed? Is there a way of getting the monies back into an RESP or some other vehicle until he needs the money? He is 18 now. What are the options? Thank you for any assistance you can provide. As long as your nephew was enrolled at the time of the RESP withdrawal, then the non-contribution portion will be considered an EAP and will be taxed in the hands of your nephew for 2012. The fact that he decided later on not to go, doesn’t change anything. So you can keep the money and do whatever you like with it. Looking for advice… We have three children ages 7, 5 and 3. We have a family account RESP setup through Nesbitt Burns but need to switch advisors. We have no other affiliation with Nesbitt Burns and therefore are looking into transferring our account to one of the major banks. I have 3 questions: 1- should we be doing a family account as opposed to 3 individual accounts, given the age ranges of our children? 2- what are recommended monthly contribution amounts? and 3- any recommendations in terms of which bank to approach? We have ruled out BMO… By the way, great website – thanks! I have been able to find nothing! My son is 28 and finally plans to return to school big time; universitity! I need to know if he is still eligible for support from the RESP Family Plan I have been maintaining for my children.